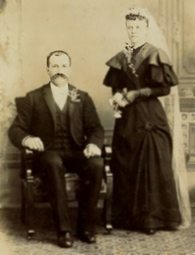 Wedding portrait of Nicholas and Mary (Wester) Klein. 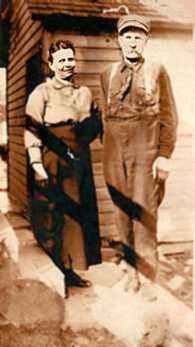 They were married 26 June 1894 at Holy Cross Roman Catholic church at Town of Belgium, Ozaukee County, Wisconsin. 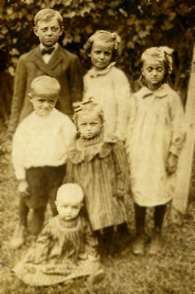 These are the first six of Nicolas and Mary (Wester) Klein's eight children: Harry, Gertrude, Martha, Joseph, Hildegard and Alexander. 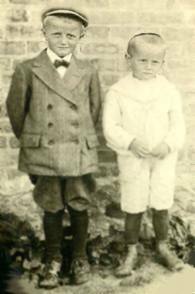 The picture was taken at Milwaukee, WI in July 1905. Florence is in the foreground. 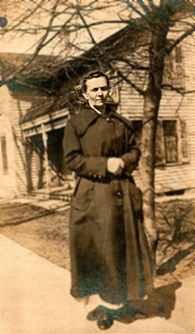 Left to right are Alexander, Gilbert, Gertrude, Mary (Wester) Klein, Hildegard, Martha and Joseph. Harry is not in the picture.